STEM outreach events often include a combination of presentation style and hands-on activities, and perhaps a chance to look into a working lab, if the event includes a site visit. On October the 24th, sophomore level students from the Gwinnett School of Mathematics, Science, and Technology (GSMST) got the rare chance to “gown up” and enter the research cleanrooms at the Marcus Nanotechnology Building, home of the Institute for Electronics and Nanotechnology at Georgia Tech. This “gowns-on” approach to outreach was planned by Professors Asif Khan and Azadeh Ansari, both of the School of Electrical and Computer Engineering (ECE), and Ms. Nicole D’Antonio, Partnership & Internship Coordinator at GSMST. Prof. Khan gave the welcome note and explained that the brains of our electronic gadgets, the chips, are made in the clean room by showcasing a 300 mm silicon wafer and a video on how sand is transformed into silicon chips. Prof. Ansari gave a brief talk on microelectromechanical systems (MEMS) devices that are used in cell phones for sensing, navigation and communication, followed by Dr. 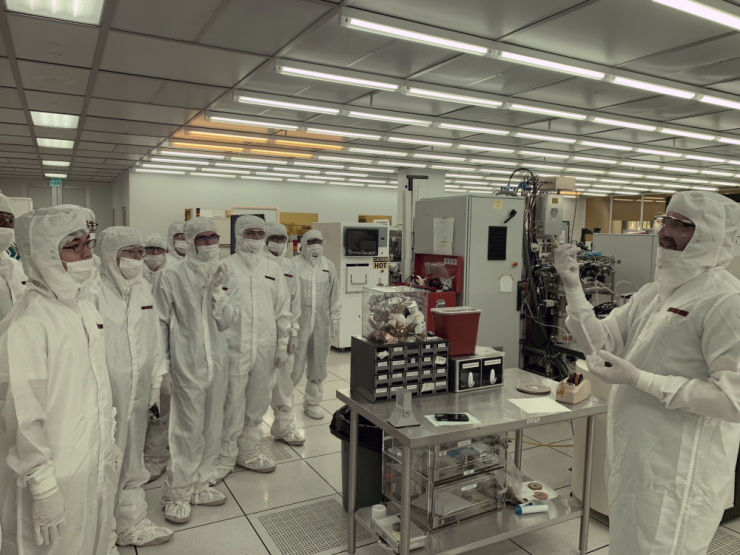 Hang Chen (GT-IEN) who gave tutorial on basic cleanroom safety and environmental protocols and the reasons for “gowning up”. 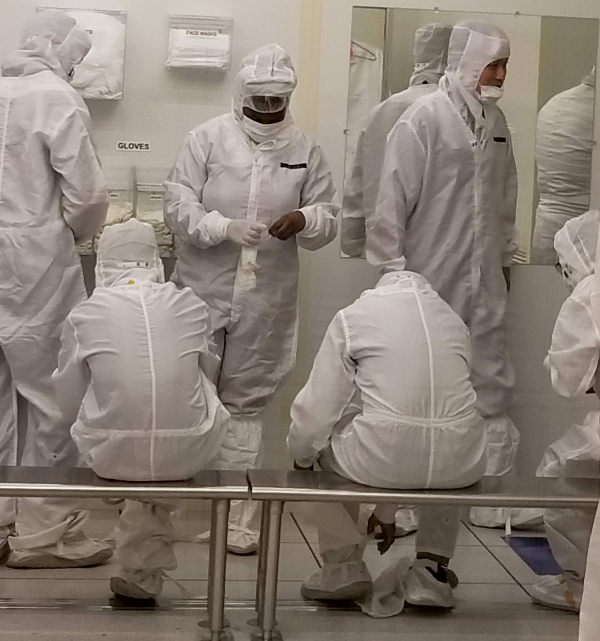 After the lecture portion, the Gwinnett students joined Georgia Tech graduate students Anthony Gaskell, Nujhat Tasneem, and Mingyo Park in the gowning room to suit up and tour the various areas of the cleanroom and fabrication tools. Professors Khan and Ansari would also like to thank graduate student Zheng Wang (ECE), who helped with organizing the visit. IEN is the organizational home for Georgia Tech's professional nanotechnology support team and physical infrastructure, which includes several research buildings and shared user laboratories valued in excess of $400MUS. IEN also enables research for individual Principal Investigators in addition to several fundamental applied research centers, engineered systems laboratories, and strategic research programs. Additionally, Georgia Tech is proud to be the primary location of the Southeastern Nanotechnology Infrastructure Corridor (SENIC), one of the sites in the National Science Foundation’s (NSF) National Nanotechnology Coordinated Infrastructure (NNCI), as well as the home of the NNCI Coordinating Office. The Gwinnett School of Mathematics, Science, and Technology began in 2007 as a Science, Technology, Engineering, and Mathematics (STEM) charter school. Gwinnett County Public Schools sought to create a new high school with a rigorous, authentic STEM-focused curriculum. The district conducted national research of existing secondary school programs, reviewing curriculum, visiting campuses, and meeting with school leaders. In March of 2006, the Gwinnett County Board of Education approved a charter that allowed for the flexibility in curriculum design and scheduling needed to realize the vision for the school. 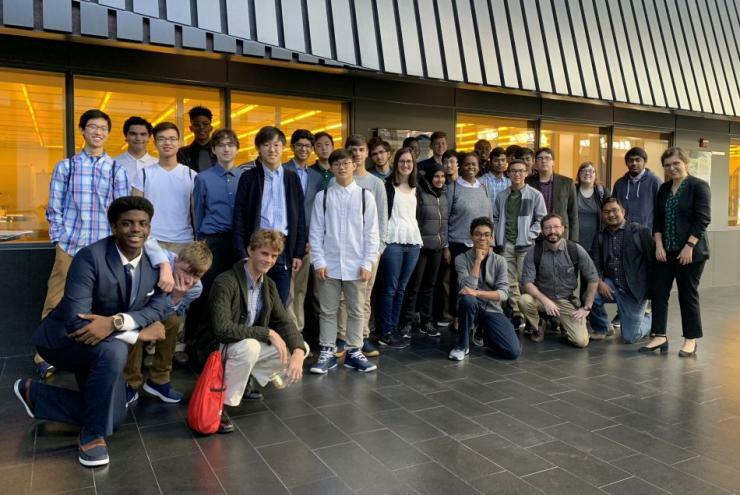 Gwinnett School of Mathematics, Science, and Technology students in the Marcus Nanotechnology Building gallery with Professors Asif Khan and Azadeh Ansari.